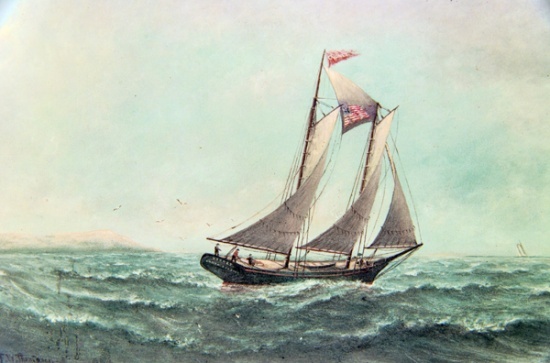 Cygnet (#5149) (+1869-1878), vessel of 28 tons that flourished around the California Channel Islands in the 1870s. Cygnet was operated by well-known seaman, Captain Martin Morse Kimberly. In 1873 as sea otters became more scarce around the Channel Islands, Kimberly traveled to the Sea of Okhotsk off Siberia and northern Japan for otters. Five years later, on his second trip to Japan in 1878, Kimberly’s ship was lost at sea with all on board in a typhoon off Japan. Cygnet is listed in the Merchant Vessels of the United States between 1869 and 1878. January 28, 1873 [DAC]: “A valuable discovery. A San Diego letter dated December 27th says: The schooner Cygnet, Kimberly, Master, forty-two tons register, went north last Spring into the Ochotisk Sea and loaded with oil. On her way back she got blown off and drifted among some islands north of Japan. Here she found so many sea otter that she threw overboard the cargo of oil and loaded with otter skins. This cargo she ran into Yokohama and sold for $25,000 and has gone back for another load. The Cygnetsailed from this port May 31, 1872, on a whaling voyage. This page was last edited on 20 September 2017, at 13:55.